[132 Pages Report] The HVDC converter station market was valued at USD 7.31 Billion in 2016 and is expected to grow at a CAGR of 7.92% to reach USD 11.57 Billion by 2022. HVDC converter stations are specialized substations that form the terminal equipment for high voltage direct current transmission lines. They convert direct current to alternating current and vice versa. HVDC converter stations are economically beneficial for transferring bulk power over long distances as they lead to low power losses and lesser environmental impact as compared to HVAC converter stations. This research study involved the use of extensive secondary sources, directories, and databases, such as Hoover’s, Bloomberg Businessweek, Factiva, and OneSource, to identify and collect information useful for a technical, market-oriented, and commercial study of the HVDC converter station market. Primary sources are mainly industry experts from the core and related industries, service providers, technology developers, standard and certification organizations of companies, and organizations related to all the segments of this industry’s value chain. The points given below explain the research methodology. After arriving at the overall market size, the total market has been split into several segments and sub-segments. The figure given below illustrates the breakdown of primaries conducted during the research study based on company type, designation, and region. The HVDC converter station market is dominated by a few global players such as ABB (Switzerland), Siemens (Germany), and General Electric (US) but regional players such as NR-Electric (China), C-EPRI (China), Toshiba (Japan) are proposing competition to the global players in their respective countries, because of to their low-cost production facilities and favorable government norms in countries such as China. 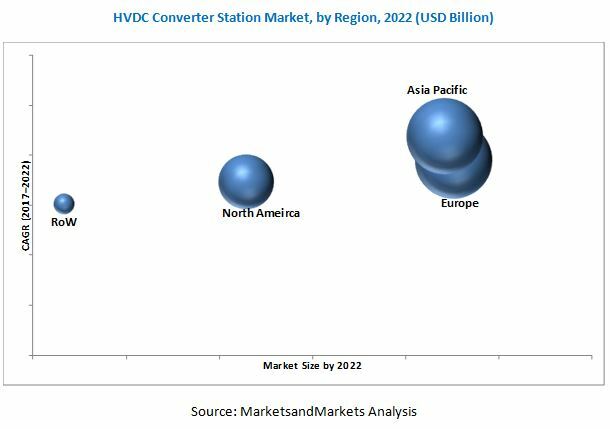 The global HVDC converter station market is projected to grow at a CAGR of 7.92%, from 2017 to 2022, to reach a market size of USD 11.57 Billion by 2022 from an estimated USD 7.90 Billion in 2017. This growth is attributed to the increasing demand for cost-effective solutions, for transferring bulk power over long distances, and increasing the need for connecting asynchronous grids. 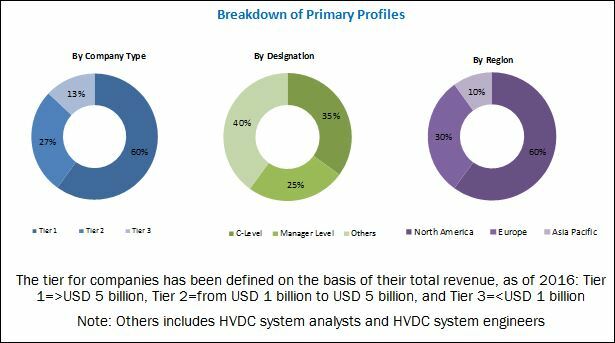 The report segments the HVDC converter station market, based on component, into valves, converter transformers, circuit breakers, surge arresters, harmonic filters, reactors, and others. The valve segment is expected to account for the largest market share in the component segment as it is the most critical asset of converter stations. In the Asia Pacific region, the investments in power transmission are increasing due to increasing demand for power efficiency from major economies to meet energy requirement and increase the transmission efficiency. The HVDC converter station market has been segmented, based on technology, into LCC and VSC. The LCC technology held the largest market share in 2016. The advancement in the thyristor valve technology is expected to drive the market for the LCC technology. On the other hand, the VSC technology is projected to grow at the highest CAGR during the forecast period, due to its ability to connect the renewable power generation sources to the grid. In addition to this, the recent development in the VSC technology provides an opportunity to transfer bulk power over 1500 MW, providing the growth opportunity for the VSC technology. In this report, the HVDC converter station market has been analyzed with respect to regions, namely, North America, Europe, Asia Pacific, and the rest of the world which includes South America and the Middle East and Africa. Europe is expected to dominate the HVDC converter station market by 2022, owing to investments in power transmission by major economies such as the UK, Germany, and Italy, among others to develop interlinkage between countries to maintain energy efficiency. The market in Asia Pacific is expected to grow at the highest CAGR from 2017 to 2022. The growth is attributed to the growing requirement from major economies such as India and China, to meet the energy requirement in the country and increase energy efficiency without affecting the national grid. The high capital cost implied to install HVDC converter stations could be one of the restraint for the market. Leading players in the HVDC converter station market include Siemens (Germany), ABB (Switzerland) and General Electric (US). Contracts & agreements was the strategy most commonly adopted by top players, constituting 95.0% of the total developments, from 2014 to September 2017. It was followed by mergers & acquisitions and expansions.